HCDC gathered over 300 signatures to get two progressive Democrats on the ballot. 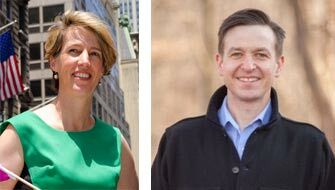 Will Yandik and Zephyr Teachout are vying for the Democratic Nomination of the NY-19 Congressional District. The primary is on June 28. The Hudson polling locations are the standard election polling locations that are used in the November general election. Not in the County on June 28? Get an Absentee Ballot. June 21: Last day to submit your application (in person or postmarked). Don't wait, earlier is better. June 27: Last day to to submit your ballot (in person or postmarked). Starting May 24th, the Board of Elections will be be open and available for Over-the-Counter Absentee voting on. Monday, June 27th - 8am -5pm: Last day to vote Absentee. If you have any questions or problems with the voting process, contact the Democrats at the Columbia County Board of Elections. Call (518) 828-3115 and ask for Jim, Corey, Rhonda, Hilary, or Virginia.